Funeral services for Katherine “Katie” Archibald, 86, of Archibald, LA were held at 2:00 PM, Thursday, January 17, 2019 at the Cedar Baptist Church, Archibald, LA with Bro. Mike Loveday officiating. Interment followed in the Lynn Cemetery, Archibald, LA under the direction of Brown-Holley Funeral Home, Rayville. Mrs. Katherine was born December 30, 1932 in Marble Hill, MO and passed away Monday, January 14, 2019 in Archibald, LA. Mrs. Katherine was a member of the Cedar Baptist Church for 60 plus years. 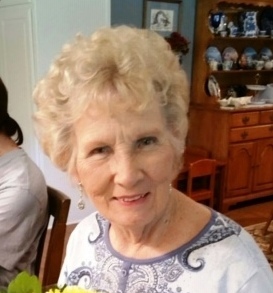 She loved to cook, shop, and play with her grandchildren and great grandchildren. She was also a charter member of the Sedente Animo Civic Club. She is preceded in death by her parents, Clarence and Lillie Vocker; husbands, Leonard B. Archibald and Charles W. Brown; her 7-brothers and 4-sisters-in-law. Survivors include her children, Suanne McDonald and husband, Charles of Archibald, Robert “Bob” Archibald and special friend, Debbie Dilmore of Archibald, James Marshall “Jim” Archibald of Archibald, Steven Michael Archibald and wife, Dawn Brand Archibald of Archibald, and Melissa Dear and husband, Frank of Archibald; special daughter, Tammie Craig Archibald of West Monroe; grandchildren, Matthew McDonald and (Joni), Adam McDonald and (Keysha), Patrick McDonald and (Maria), Christopher Archibald and (Randi Lynne), Sarah Archibald and (Scotty), Samuel Archibald and (Shelbie), Lillie Stanley and (Jarrett), Will Dear and (Torie), and Grace Dear and (Dustin); 10-great grandchildren; stepdaughters, Sandee Brown and Nancy Purdy; stepsons, Jim Brown and Gary Brown; and numerous nieces and nephews. Pallbearers were her grandsons, Matthew McDonald, Adam McDonald, Patrick McDonald, Christopher Archibald, Samuel Archibald, and Will Dear.